The FS10 level sensor is based on a float with magnetic transmission technology. The sensor is comprised of a guide tube with embedded Reed contacts, one or more floats with fitted ring magnets and a process connection module. The float is raised by the rising liquid in the tank and operates a Reed contact through the guide tube wall by means of the magnetic field produced by permanent magnets located in the float. This Reed contact can be designed as a NO, NC or changeover function. 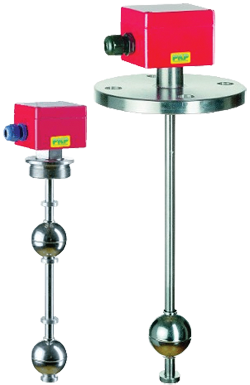 FS10 magnetic float level sensors are suitable for monitoring the level of practically all liquids, e.g. as a full or empty tank sensor, for controlling valves and pumps and for alarm function. The potential free Reed contacts fitted in the level sensor make it an ideal control element when coupled with PLC controllers.